What Can I Expect from an Online Bachelor's in Public Policy and Administration Program? What Can I Do With a Bachelor's in Public Policy and Administration Degree? Policy administrators create, implement, and manage the strategies and plans of organizations, both public and private, ensuring that they are effective and in accordance with current laws and guidelines. An online degree in public policy provides a comprehensive understanding of fundamental political and business-related skills, from team management and financial analysis to public accountability and ethical concerns. The field of public policy and administration is complex and encompasses many sectors and industries, making it possible to craft a degree that fits your interests and career goals while preparing you for positions in all levels of government, large corporations, or nonprofit organizations. Because an online bachelor's in public policy and administration is preparation for management positions, a number of paths are available. Those who want to work in the public sector might consider a career as social and community service managers. According to the U.S. Bureau of Labor Statistics, this field is projected to grow 10% in the next seven years. Public policy and administration requires an interdisciplinary skill set that combines business strategy and management with a deep understanding of government regulations. There are many options for specializations to fit your interests, including public health, nonprofit fundraising, international political regulations, homeland security, criminal justice, and private-sector business relationships, among many others. While advancement in these positions may require further education and experience, an online bachelor's in public policy and administration offers a strong foundation. Core topics include policy development and implementation, administrative law, public sector finance, team leadership, and public service values. A traditional aspect of social science and business degrees are co-educational and professional experiences, such as internships and conference participation. And because public administrators often work or lead teams, group work is often incorporated in the structure of the online classroom through synchronous discussions and other interactions. FIU is a public research university with two campuses: a location in West Miami-Dade County, and a campus in North Miami Beach. FIU offers several degree programs online, including a bachelor's in public administration (BPA). The program is ideal for students looking to pursue managerial careers in the government and nonprofit sectors. Through the FIU system, students in the online public administration bachelor degree program can learn from anywhere in the world, at any time, using an asynchronous class format. To be considered for admission into the BPA program, applicants must have either earned an associate of arts degree from a Florida community college or completed 60 college credits. Students who don't meet this requirement must complete university core curriculum requirements before earning a bachelor's degree at FIU. In addition, applicants to the online bachelor's in public administration program must also demonstrate competency in either a foreign language or American Sign Language. This requirement may be waived with a sufficient score on a relevant Advanced Placement, SAT II, or CLEP exam. Students graduate after completing the required 120 credits, including 60 public administration credits. Located in La Jolla, California, National offers a bachelor's of public administration degree comprised of 180 quarter credits, including more than 70 quarter credits of general education requirements. Students may enroll in the program at any time, and can transfer credits earned with a letter grade of "C" or above. National's partnership with the Council on Adult and Experiential Learning allows students to take advantage of a portfolio-based assessment program where they can earn credit for previous experience, including prior employment, training, volunteer service, and independent study. National's BPA program prepares students to work at various levels of local, state, and federal government. Courses cover introductory topics, such as principles of microeconomics, and build to more in-depth content addressing topics like best practices in nonprofit and government management. Students with a GPA of 3.0 or higher who are within six courses of graduation can participate in a BPA/MPA Transition Program. This program allows students to take two graduate-level public administration courses as electives in completing their BPA, an excellent foundation for public policy and administration jobs. A Jesuit university with a rich tradition, Regis offers courses both online and on campus through the lens of the Jesuit Catholic faith. Regis is a leader among online public administration bachelor degree programs and offers a bachelor's of science in business degree with a specialization in public administration. The program is designed to balance both theory and practice, ensuring students graduate capable of working for the public good while balancing the interests of diverse stakeholders -- a cornerstone of effective public service delivery. The accelerated public administration degree online program requires students to complete 30 credits of foundational courses, 33 credit hours of upper-division credits in a chosen specialization area, and 20 elective credits. Required courses span disciplines including economics, accounting, statistics, and management. For students hoping to continue on to graduate studies, the university's College of Business and Economics allows matriculated students to concurrently pursue graduate degrees. Ideal for students who want to serve the greater good by working in public policy and administration jobs, CBU's bachelor's of arts in public administration degree focuses on real-world problem solving, social issues, and government systems. Classes include both core courses and classes specific to the public administration major, including constitutional law, organizational theory and design, and political economy. CBU's online programs are designed for distance learners with demanding schedules, offering 24/7 flexibility. Beyond its celebrated academic offerings, CBU is known for providing an education rooted in the Baptist faith. The school merges a Christ-centered educational experience with opportunities for all students to experience spiritual and social development -- both online and in traditional, on-campus programs. To this end, students are required to take courses aligning with the Baptist faith, including an overview of the Bible and foundations of Christian thought. UH-West O'ahu delivers an online public administration bachelor degree with a concentration in general public administration designed to help students succeed as management and administration professionals in the public sector. The school also offers the degree with concentrations in disaster preparedness and emergency management, healthcare administration, and justice administration. To graduate, students must complete coursework covering administrative and legal practices, along with a required senior project or administrative practicum. UH-West O'ahu does not offer any degree programs completely online; some lower-division coursework must be completed in person. Distance learning formats include online learning -- where courses are taught completely online through the Laulima Learning Management System (LMS) -- and interactive television, using classroom facilities at other community colleges in Hawaii. The school allows incoming students to transfer previously-earned credits, with a limit of 21 credits each for lower- and upper-division coursework. Located in Flagstaff, Arizona, NAU delivers 150 degree programs to more than 30,000 students, both on campus and online. For those looking to pursue an online public administration bachelor degree, NAU offers a bachelor's of applied science program in administration. The program focuses on leadership, management, and ethics topics central to success as a public service professional at the local, state, or federal level. Beyond NAU's standard admission requirements, students must have an associate degree from an accredited institution to be accepted into the BAS in administration program. To graduate, students must complete 120 credits (including 30 upper-division credits) and finish the program with a GPA of 2.0 or above. For prospective students concerned about cost, NAU offers a pledge that guarantees enrolled students pay the same tuition for all four years, making it easier for students to budget for their education. The University of Maryland University College offers fully accredited and career-centered distance education programs. Among the degrees available is an online bachelor of science in public safety administration that prepares students for careers in public policy and administration. UMUC’s curriculum focuses on hands-on learning: students work collaboratively on assignments guided by federal statistics and best practices. Students must complete 120 credits, up to 90 of which may be transferred from another college or university. Course topics include public safety leadership, decision making, and public safety administration ethics. Students also have a large number of electives to choose from and personalize their academic experience. UMUC is dedicated to the success of all students; distance learners enjoy 24/7 technology support and access to several professional organizations, including the International Association of Emergency Managers. UMUC also offers a Public Safety Administration forum, where undergraduate and graduate students can chat about their coursework and review local job openings. A bachelor's degree in public policy can serve as a major asset for those looking to excel in public policy and administration jobs. At La Verne, distance learners can pursue an online bachelor's of science degree in public administration that covers the fundamental theories and practice of management in the public sector. Students can complete all coursework and projects through La Verne Online in collaboration with the Blackboard LMS. To earn this 40-credit degree, La Verne requires students to complete 28 credits of core requirements (including courses on the foundations of business ethics and administrative processes) along with three elective courses. To keep education affordable, La Verne assists students in coordinating aid from federal and state departments, in addition to loan programs. Students who attended a California high school for three years may be eligible for the La Verne DREAMers program, which exempts selected students from paying nonresident tuition. At this time, this program is only available for California residents. Located in Fayette, Missouri, Central Methodist University offers a diverse catalog of online degree programs, including a bachelor's degree in public administration. Applicants must have a minimum 2.5 GPA and have earned either a 21 on the ACT or 1500 on the SAT. Transfer applicants are required to have at least a 2.0 GPA from their previous college coursework. The 124-credit curriculum features coursework in constitutional law, public policy analysis, and urban and rural sociology. Coursework is geared toward students who want to make a difference in their communities through educational, healthcare, or other public programs. All online students enjoy the same low, flat tuition rate. An affordable choice for distance learners, SPC offers a lower cost per credit than most colleges along with access to a range of scholarship and financial aid opportunities. Grant opportunities at SPC include the Federal Pell Grant and Federal Supplemental Educational Opportunity Grant. Students may apply for various scholarships, including Florida Bright Futures scholarships and SPC Foundation scholarship options. SPC's public administration degree online is built around helping students develop the skills needed to solve complex problems and excel at essential tasks like budgeting, developing strategic plans, and evaluating programs. Core courses in the program include community relations theory and practice, public finance, and personnel management. After completing 27 credits of core requirements, students can select from dozens of electives and subplan core courses, including courses in criminal justice, fire science, and emergency management and homeland security, to fulfill the required 120 credits for the degree. Students seeking to earn a public policy degree online should consider Indian River State College (IRSC), located in Fort Pierce, Florida. IRSC's bachelor's of science in public administration program allows students to concentrate in either emergency planning and management or public policy and leadership. Emergency planning and management students gain a thorough understanding of incident command, emergency services public policy, and conflict resolution. Public policy and leadership students focus on project management and resource distribution at the regional, state, and federal levels. The two program tracks include several courses in common, including foundational courses such as an introduction to public administration and organizational behavior and administration. Each track requires students to complete 60 credits in order to graduate. IRSC's bachelor's in public administration program may be completed 100% online. The school's virtual campus uses the Blackboard LMS, where classes and assignments are available through an easily accessible online learning platform. Founded in 1956, Roger Williams University is a private liberal arts institution that provides flexible academic programming for students. Distance education options include an online bachelor of science in public administration. The degree combines theoretical knowledge in ethics and international politics with applicable skills in financial administration and the management of sector-based organizations. RWU's 120-credit program includes classes in organizational theory of management and public personnel administration. The curriculum follows the standards of the Network of Schools of Public Affairs and Administration, an international association of public affairs schools. Courses include organizational theory and management, effective speaking across audiences, and city management. To apply, candidates need to submit an official high school transcript or GED, standardized test scores, a personal statement, and at least one recommendation letter. Online tuition is priced per three-credit course. Operating since 1875, Park University is a private, nonprofit institution located in Parkville, Missouri. Although not available entirely online, Park's bachelor's of public administration program offers flexible coursework to accommodate student schedules through a blended format. The program requires students to attend weekly activities on campus, and students complete between 20% and 40% of coursework through online activities and assignments. Students generally spend about two hours per week on online learning. Park's public administration major is perfect for students seeking public policy and administration jobs. A 45-credit program, the degree requires students to complete a range of coursework on topics like statistics, accounting, and administrative law. The program offers five interdisciplinary areas of emphasis, including business relations, criminal justice, fire service management, homeland security, and public service. Park provides reduced tuition rates for active-duty military members, active-duty dependents, and military veterans. Scholarships may also be available for other specific student groups, such as single mothers and fathers. For more than 160 years, Upper Iowa University has been offering accessible academic programming, including hybrid and fully remote degree options. The online bachelor of science in public administration is one such program. Totalling 120 credits, the UIU public policy degree online program consists of required courses like public budgeting, administrative law, and comparative politics. Students choose a concentration in one of five areas: policy and politics, emergency management, fire science, law enforcement, or a general track. An emergency and disaster management certificate is also available. UIO graduates leave equipped not only with the skills needed to manage public programs effectively, but also the interpersonal and cultural knowledge necessary to work empathetically with diverse groups of people. Six sessions are offered every year, enabling distance learners to pursue degree work at their convenience. Applicants must have a minimum 2.0 GPA. PPU's bachelor's of science in public administration degree is an investment that can lead students to a successful career in government. The 100% online degree program is a standout among online public administration bachelor degree programs, with a real-world curriculum designed by professors with public service experience. Courses cover topics like budgeting, policy, and decision analysis. Each course lasts eight weeks, and students generally complete the program in two to four years. PPU's bachelor's of science in public administration program requires students to complete 120 credits and includes emphases in EMS administration and fire service, as well as a general concentration. The program's general concentration is best suited for students who want to gain expertise in solving organizational problems and work in public leadership. To be accepted into the program, students must provide a high school (or postsecondary) transcript with a GPA of 2.0 or better, and may be asked to participate in an interview prior to matriculation. Below is an overview of what coursework and specializations you can expect from degrees in public administration online programs. Note that these are guidelines only, and you should discuss your educational needs and goals with a school's academic and enrollment advisor. Below are courses generally found in online bachelor's in public policy and administration programs. This section outlines the general degree curriculum, but it is always best to look at a school's specific requirements before applying. Introduction to Public Administration: A common course in these programs, it prepares students for advanced coursework by introducing fundamental topics and skills in the development and importance of modern government operations at the local, state, and national levels. This is a useful class for the academic and professional development of all public policy administrators. Administrative Leadership & Behavior: Public policy administrators are expected to have strong leadership skills, and this course prepares graduates for management and other organizational leadership positions. By diagnosing human and group behavior, students analyze and solve problems in an organization or a community, including motivating people to work towards positive change. The American Government: This course introduces the political culture of the United States, including constitutional laws, structural guidelines, current trends in policy development, and conflict and consensus in the electoral system. A strong understanding of how our government functions is useful for nearly every position in this field. HOW LONG DOES IT TAKE TO GET AN ONLINE BACHELOR'S IN PUBLIC POLICY AND ADMINISTRATION? A online bachelor's degree in public policy is 120 credit hours or more, and includes general education requirements, major core classes, and courses in general electives and/or concentration areas. Internships are usually another requirement for this degree, and many programs offer opportunities through partner organizations. Students may also complete this requirement in their local community. Online programs usually have flexible transfer policies, and distance learners can often transfer many of their degree hours from community colleges or other institutions of higher education. Because public policy and administration requires strong interpersonal skills, a cohort learning model may be implemented in the degree through group discussions and projects. However, distance learning also requires students to work independently, so finding a program with a combination of learning styles is an important feature to consider as you locate schools that best suit your needs. When looking at potential colleges and universities, it is important to ensure the institution is accredited. Accreditation guarantees the quality of an education and how well the degree is received by potential employers. 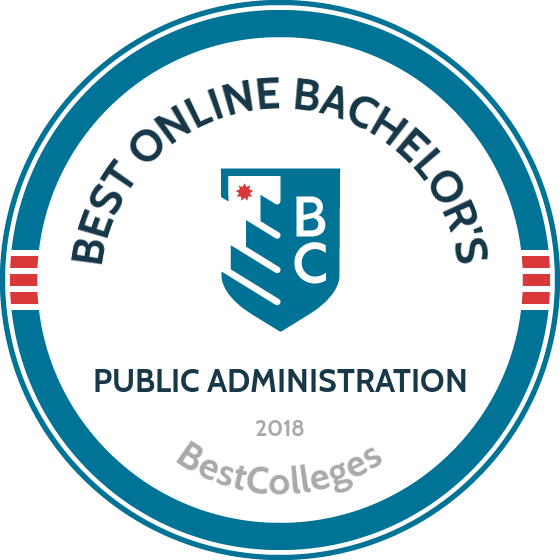 The best online bachelor's in public policy and administration have both national and regional accreditation. National accreditation is granted by the U.S. Department of Education (DOE) and/or the Council for Higher Education Accreditation (CHEA). This is the most popular form of accreditation, and it is impossible for a school to grant any academic degree without it. While it is rarely the case that a college or university receives accreditation from only the DOE or CHEA, the two are not the same. The DOE is a government organization, whose stamp of approval is needed for schools to receive federal aid. The CHEA is a private institution that establishes another set of academic and professional standards, most of which concur with DOE stipulations. For more information, explore the DOE's and CHEA's websites. Regional accreditation, though not as well-known, is equally as important, and ensures your degree is recognized by the state in which the school resides. Granted by one of seven national organizations, this level of recognition is important to employers, since many deal more closely with state regulations and policies than they do with national mandates. Finally, there is professional recognition in the field, which can come from a number of private organizations, including the Association for Public Policy and Management and the American Society for Public Administration. An online degree in public policy leads to a large number of diverse career paths that deal with government policies and their financial, cultural, and political impact on communities in the United States and abroad. Professionals in these fields are leaders who work with and motivate others. They also work within current laws and regulations to design and implement creative solutions to challenges facing their organizations. Usually employed by nonprofit organizations and government agencies, fundraisers create events and campaigns to raise money, goods, and services. They also work with designers to create materials that raise awareness and promote an organization's mission and needs. These professionals promote wellness through education and other forms of individual and community engagement. They collect data in order to develop and implement strategies towards these goals. Professionals in this management position prepare and implement procedures to respond to natural disasters and other kinds of emergencies. They also work with government and other public officials to ensure these plans are effective. For many career fields, a higher level of education usually means opportunities for advancement and higher salaries. According to the 2015 salary survey published by the National Association of Colleges and Employers (NACE), individuals employed in the “Public Administration and Social Service Professions” category experienced a 21% increase in salary after gaining a master's degree. While official academic recognition is not the only factor, pursuing a graduate education opens more opportunities for professional development. City Management & Urban Policy: Also known as city or urban planning, students in this master's degree design and create architecture and infrastructure in an urban setting while considering the environmental and quality of life implications. Public Policy Analysis: Students in these programs use research and statistical methods to evaluate the impact of government or an organization's policy and procedures. Homeland Security: These master's programs involve issues of public security at the national and international level. Course topics include public health preparedness, information security, and agricultural biosecurity, among others. Careers in public policy and administration are expected to grow over the next seven years, as projected by the United States Bureau of Labor Statistics. Below is median salaries for emergency management directors across the top five sectors. Current data suggests that employment in private companies and organizations yield higher salaries overall, though this does not factor the differences in job growth across these industries. Additionally, the numbers below do not take into account overtime, which is often required of employees in these industries. Membership in one or more of these professional organizations grants access to networking opportunities, professional and academic resources, conference participation, and up-to-date research and literature. These organizations also frequently hold seminars, webinars, and other events for professional skill development, with the opportunity to gain certification in specific areas. For example, the Association for Public Policy and Analysis & Management holds a yearly “boot camp” designed to give undergraduate students a comprehensive crash course on current challenges and developments in the field. A not-for-profit organization dedicated to improving public policy and administration by facilitating research, analysis, and education. APPAM also works to improve diversity within the field. The ASPA is the largest and most well-recognized professional organization in the field. It promotes excellence in the practice of public and nonprofit administration. Founded in Paris in 2014, the IPPA is one of the fastest growing organizations in the public policy and administration field. Its mission is to foster global relationships for professionals wishing to use their skills for the betterment of the international community. Loans are a popular choice to finance a higher education, but it is not the only option. By completing the Free Application for Federal Student Aid (FAFSA), you can find a variety of other methods that will help you avoid debt, including grants and scholarships through national organizations. Additionally, the field of public policy and administration is closely connected to service and advocacy, and a number of award opportunities are available at the state and local levels of government for those willing to serve in those communities. Financial assistance, including work-study positions, and paid internships, are also usually offered by individual colleges and universities.